Click near the bottom of this map where the Jordan River begins at the end of the Dead Sea. Notice how close Jericho is to Jerusalem and the Mount of Olives. Click on Jericho to see the Old and the New Testaments come together! We travel up the Jordan Valley. 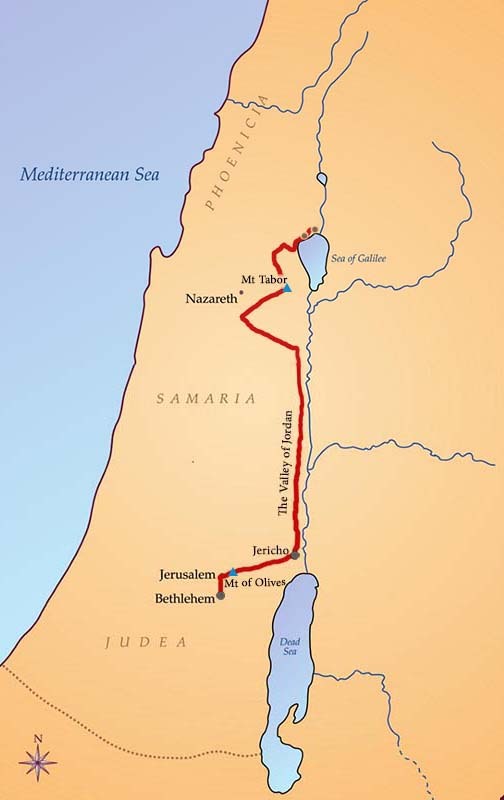 Our modern-day road takes us almost all the way to Nazareth, and we pass by Mount Tabor. Finally, we go to the Sea of Galilee (Lake Tiberias) and visit sites at the northern end of it. Click on the two circles (indicating towns) there.